By Dan Ambrose: Freddie Roach is one of many people who think Saul Canelo Alvarez (49-1-2, 34 KOs) should be given a long suspension by the Nevada State Athletic Commission when they meet this month on April 18 at their hearing to decide his case for testing positive twice for the banned substance clenbuterol. 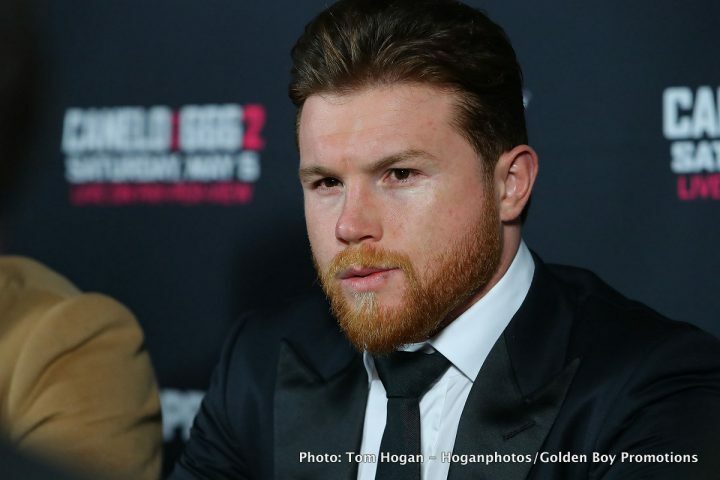 Canelo is hoping he can be cleared by the Commission so that he can face IBF/IBO/WBA/WBC middleweight champion Gennady ‘GGG’ Golovkin (37-0-1, 33 KOs) on May 5 at the T-Mobile Arena in Las Vegas, Nevada. Roach says a positive test for a banned should be viewed as “attempted murder” due to it being a sport that involves fighting, and he wants him to receive a long suspension if it turns out that he’s guilty of having used clenbuterol on purpose. It’s impossible to attach a label of Canelo attempting murder by his 2 positive tests for clenbuterol. Roach sees it as very serious for any fighter testing positive for a performance enhancing substance before a fight. However, if the boxing Commissions did start viewing fighters testing positive for PEDs as attempted murder, it would mean suspensions would likely go far beyond just the 6 to 12 month level. You would have to assume the Commissions would start giving lifetime bans if they equated positive tests for PEDs to be the same thing as attempted murder. Canelo’s excuse for his 2 positive tests for clenbuterol last February was he ate contaminated beef while in Mexico. That excuse might be rejected by the Commission at their April 18th hearing, but it’s possible they might accept it. It will depend on a lot of things. Canelo might have the information where he ate the contaminated meat that he can give to the 5-member Commission. Roach says one way of finding out the truth is for Canelo’s hair to be tested for clenbuterol. He says a strand of Canelo’s hair should be tested for the substance. If he’s been using clenbuterol intentionally, then the hair test will show that. There’s zero talk of VADA or the Nevada Commission planning on using a hair test to verify Canelo’s excuse of having eaten contaminated. It might not matter though. If the Commission decides Canelo is guilty based on his 2 positive tests, then it’ll be irrelevant whether his hair is tested. ”I’m thinking the punishment is not enough,” Roach said to K.O. Artist Sports. ”If they give him a $20,000 fine and a slap on the wrist, it doesn’t help the sport. The thing is if they made things where they should be like attempted murder or something like that, because is in a combat sport, you know? Let’s face it that can happen,” Roach said. Roach isn’t saying how long Canelo should be suspended for by the Commission. It’s thought that Canelo could get a 1-year suspension with 6 months reduced. A longer suspension of more than one year would be unlikely. Canelo, 27, has never tested positive before in any of the tests by VADA, so he’s a first timer. What some of Canelo’s boxing fans are saying is that clenbuterol isn’t an anabolic steroid, and it’s not something that will help him add muscle. It’s a substance that helps lean out muscle, improve stamina and oxygen carrying ability. It won’t add muscles to a fighter, but it could help them fight harder with improved stamina. That’s not a good thing for Golovkin if one of his opponents can hit him with a greater frequency with the help of clenbuterol. Canelo showed a problem with his endurance in his fight with GGG last September. A substance like clenbuterol would potentially come in handy for a fighter with stamina problems. “He got caught doing something illegal and he should be suspended,” Roach said. “I actually think he should be suspended for a longer period of time, because if you don’t make it hurt them, they’ll just laugh at it and he’ll be slapped on the wrist and go. They need to be more strict. No, the suspension should carry over to that [September],” Roach said. It would be a shame if the Commission suspended Canelo for more than 1 year for his first guilty test for a PED. But if the Commission wanted to get the attention from the boxing world, they would achieve that by giving Canelo an extended suspension of 2 to 3 years. Of course, if the Commission gives Canelo a long suspension of that amount of time, it’s hard to imagine him not electing to go outside of the U.S to continue his career where he would be free from the suspension. Canelo is from Mexico, and it’s debatable whether they would honor a long suspension given by the Nevada Commission in that country. ”If he did get it from a cow, there’s ways to test for that also,” Roach said. ”There’s ways to find out the truth. “There’s guys that are really good at cycling and all that, but the guys catching them are even better. He [Canelo] said he got it from a cow. It’s a possibility though, but will it really carry over into the meat? It sounds like it would need to be in there for a really long time. They can find out how long it’s been there in their system with one strand of hair. It’s that easy. They can tell how long you’ve been on it with one strand of hair,” Roach said. I don’t think VADA has gotten to the stage where they’re doing hair strand tests for drugs and substances. In theory, it sounds like a great idea for VADA to test Canelo’s hair for clenbuterol, but they might not have gone that far with their testing methods. Again, if the Nevada Commission is going to consider a fighter testing positive for a substance as having broken the rules regardless of their excuse for how the substance got in their system, then it really doesn’t matter if their hair is tested. They’re already broken the rules by testing positive. ”The thing is, they need to be strict about this,” Roach said about Canelo. ”You’ve got to make them think twice about doing it, but they don’t have that right now. It does taint the fight a little bit, and if it does go ahead, it will taint the fight, yes,” Roach said about the Canelo vs. Golovkin fight. Roach sounds like he wants a long, long suspension given to Canelo for his 2 positive clenbuterol tests. I don’t think it’s reasonable to assume that the Nevada Commission will hand down a long suspension to Canelo. He makes a lot of money for his fights in Las Vegas. If they suspend Canelo for more than 1 year, it would be lost money for the city of Las Vegas. It’s possible the Commission will give Canelo a 12 month suspension and then cut it in half to 6 months due to this being his first offense. The Commission can come up with a number of reasons to reduce his suspension to just 6 months. A suspension of six months means Canelo only misses one fight. Fighters miss one fight all the time due to injuries or simply them choosing to stay inactive to enjoy themselves. I don’t think six months will be a big deal for Canelo. What would be a big deal for Canelo would likely be the Nevada Commission giving him a 1 year suspension without it being reduced. Canelo missing an entire year would be a major blow to his career, especially given that he hasn’t fought in 7 months. If the Commission gives Canelo a 1-year suspension, then he’ll have missed out on 1 ½ years of his career without fighting. It’s not easy for fighters to come back and still be the same fighter after missing that much action. With any sport, losing 1 ½ years would erode the skills of that athlete and they may never be the same again.